VedicMaths.Org - 8 - The nine point circle. Mark a point at the top of a circle and divide the circle into three equal parts by marking two more points on the edge. Similarly divide each of these three sections into three equal parts so that you have a circle marked with nine equally spaced points. Label the top point "9" and number the other points anticlockwise from 8 to 1. This figure is called the nine point circle (enneagram). Our number system uses just nine digits and zero so this diagram represents number in general (the circle itself can be thought of as zero). All greater numbers are just combinations of these. This simple device has a great number of useful applications. You can for example show each of the multiplication tables as a pattern on the circle. The multiples of 2 for example are 2,4,6,8,10,12,14,16,18,20 . . . Reducing these using digit sums we get 2,4,6,8,1,3,5,7,9,2 . . . So to get the pattern for the two times table we start at 2 on the nine point circle and draw a straight line to 4, then a line from 4 to 6 and so on until the pattern begins to repeat itself. Any sequence of numbers can be reduced with digit sums and shown on the nine point circle: the sequence of square numbers, cube numbers, triangular numbers, the Fibonacci sequence and so on all have interesting patterns as do the digits in recurring decimal expansions of fractions. And then there is the sequence of prime numbers, the digits of pi etc. By allocating a note of a specific pitch to each of the nine digits any pattern can be heard. Some nice tunes can be constructed in this way. We can continue to number round the circle so that, as 10 follows 9, we write 10 next to the 1. Then we put 11 next to 2, 12 next to 3 and so on. We can continue indefinitely, going round and round the circle so that all whole numbers are represented. Next we note that the digit sum of 10 is 1 and 10 has been placed next to 1. Similarly the digit sum of 11 is 2 and 11 has been placed next to 2. And so on. This shows that all whole numbers can be basically related to one of the nine numbers and that every whole number can be reduced to its 'base number' by finding its digit sum. The number 1884, for example, has a digit sum of 3 and so will be located on the 3-branch of the nine point circle. This also shows clearly that 1884 will have a remainder of 3 when divided by 9. And also that if the digit sum of a number is 9 then the number is divisible by 9 and it is not divisible by 9 if the digit sum is not 9. Zero and the negative numbers can be included on the circle by counting backwards from 1: so zero goes at 9, -1 at 8 and so on. Where might 1.5 be placed on the circle? Perhaps half way between 1 and 2, which is opposite the 6 (and the digit sum of 1.5 is 6). And so on for other numbers with halves. Other fractions can also find their place in this system. Possibilities multiply when you have two (or more) circles. Or when you use the space inside the circle as a second dimension. If you are interested in the philosophical aspect of numbers the nine numbers can represent the steps in the creative process (on an individual or cosmic level) where one represents the creator and nine the full creation, with all the stages of the creative process in-between. "The science of numbers is a practical science which helps us in daily life and also helps us to understand the mysteries of the universe". These are the words of His Holiness Sankaracarya Santananda Saraswati in an interview in the 1970's, from which the following quotation is also taken. "The mathematical proposition which is given by philosophy is the collection of laws under which the universe works. The philosophical aspect of mathematics fits in perfectly well with the pattern of the universe. "Read this interview, in which the qualities of the numbers are described in cosmic terms. Thus, though it is a very simple device, the nine point circle gives us new ways of looking at numbers and their relationships and meaning. An excellent article entitled "Try a sutra" was published in the 19th May issue of the Times Educational Supplement (a UK publication). This was written by Mark Gaskell and described the many positive effects of teaching Vedic Mathematics to 11-14 year old pupils. This must have been extremely well received as the counter on the .org web site increased by over 5000 in the week following publication! We hope to have this article available on the site soon. Andrew Stewart-Brown writes: "The Association of Teachers of Mathematics conference at Westminster College, Oxford, England on Mathematical Dreams and Visions, 17th - 20th April 2000 was attended by about 300 delegates and was very enjoyable. The extra session on Vedic Division which I provided attracted 20 people. This is excellent for a session which had not been advertised previously. In fact, some of the very good mainstream sessions attracted only 3 people. My aim was to introduce the audience to urdhva-tiryag division with a 3 digit divisor and the use of vincula,* in one hour. I reckoned on a very numerate audience, and while not many felt that they could quite divide a large 6 digit number by a 3 digit number in the half a minute promised by my advertising (! ), everybody could follow the methods and had great fun. Plenty of appreciation was expressed. One teacher said, 'You've made my conference, I've been searching for an alternative algorithm for division for years !' Others said it was inspiring, enjoyable and surprising. They particularly like the freedom which the vinculum gives, and the way one only has to divide with a single digit. Most interesting of all were comments received from those who were au fait with the numeracy strategy of the National Curriculum. One, a primary school teacher, described the 'chunking' method for division which is taught in Key Stage 2 and felt that the Vedic method, while easy and fun, would be somehow disallowed. (I think the chunking method is a kind of repeated subtraction.) This lady seemed to feel almost guilty at having found a good method which was, in her mind, definitely not part of the Numeracy Strategy. The next day another lady, a Maths Adviser, came up to me and said that she disagreed strongly with the idea that Vedic Maths did not fit in with the Numeracy Strategy. The whole purpose was to encourage children to use their own methods as long as possible, and only narrow down to the single 'received' method when it became necessary. To provide them with several methods appropriate to different kinds of multiplication sum, for instance, as Vedic maths does, was consistent with the intelligent mental use of number which the strategy was intending to promote. Maths Adviser definitely trumps primary school teacher - as you can see from the capital letters. Next year at Chester, the question of whether Vedic Maths can be used to raise standards at Key Stages 3 and 4 will need to be addressed directly. On the basis of the interest aroused this year, 30 or 40 people might well come to such a talk." * The vinculum is a minus sign placed on top of a digit. This allows the creation numbers which are a combination of positive and negative digits. So 19 for example could be written as a two followed by a one with a minus on top, because 19 is one below 20. In my recent trip to the USA I gave three presentations: The first was to a non -mathematical audience of about 50, at The Mystic and Noank Library in Connecticut. I presented more than 10 of the 12 chapters of the Circle revelation in an hour and 35 minutes - a short course in geometry at one sitting! The second was to about 30 members of the Mystic Rotary Club, at the Mystic Hilton Hotel. The third was an hour and a half demonstration to a class of 15 or 16 youngsters, 11 or 12 years old, at Squadron Line School in Simsbury. Their applause at the end was the most rewarding moment in my trip. Some encouraging things are happening, but far too few people are registering the colossal difference between this system and Euclid 'Elements' - mainly because almost no-one today has any contact with the 'Elements'. Consequently people have nothing to compare this system with. What can I do about it? True, I can point out that these proofs are very brief individually, and that far fewer steps are required to obtain the results than in Euclid's system. Take that half- hour presentation to the youngsters, mentioned above. To cover the same ground directly from Euclid's ' Elements' would require going through more than 83 Propositions (and few of Euclid's propositions are brief), plus axioms, postulates and definitions. Not much chance of doing that in half an hour! We get enquiries from time to time from graduate and post graduate students who are very keen to take up research in Vedic Mathematics. If you know of any research opportunities/grants for overseas students or if you think that a certain area will benefit from being tackled from a Vedic perspective please let us know. There is also a need to carry out research that compares traditional mathematics teaching with Vedic Mathematics teaching. It appears that the Vedic system is more efficient, enjoyable and faster, and has other beneficial effects (makes students more creative, gives confidence, improves memory etc.). We need researchers to carry out these studies and/or a College/University willing to take an interest in this research. 1) Host the site properly. This is instead of redirecting the user to the locations of our pages via a frame based page hosted by feeeparking.co.uk. 2) Use a pop down menu system to make it easier to navigate the site, whatever page you are currently viewing. We plan to duplicate the material on the site in order that those older or non Netscape/IE browsers can still access the features of this site. 3) Add more simple tutorials to the site that use java applets to automatically test the user. 4) Add some more community style areas to the site: Address book/Notice Board/Chatroom. 5) Add some more material to the site: More articles/history/Answers to Frequently asked questions/discussion of the future and research/etc. 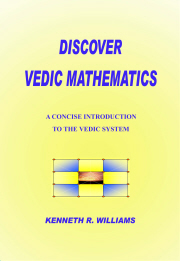 6) There is some video material on Vedic Maths. When we receive a copy, this will be added to the site in realplayer format. 7) We wish to make the site look graphically better, but are not sure of the style of graphics the site should have. So any suggestions you have for look and feel are welcome. 8) It should be possible to demonstrate some principles from Vedic Maths using Flash animations. We will investigate this as time allows. 9) Update the web site list from a current search of what is out there on the net. 10) Further promote the existence of the site.